Ladies & Gentlemen, Are You Ready To Take The ACT? Taking standardized exams like the ACT is like trying to win a race. 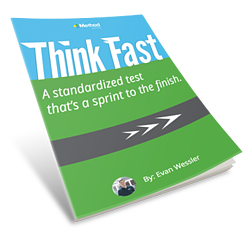 In our latest eBook, Method Test Prep's very own Evan Wessler shares his reflections on taking the ACT himself, focusing on the speed and strategy necessary for excelling on the test! We hope that knowing the basic essentials to consider while preparing for the test will help alleviate some of the pre-exam stress most students experience.